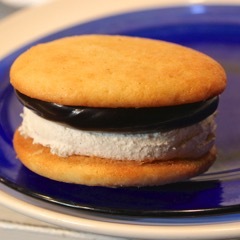 The Whoopie Pie; Maine's Official "State Treat"
Made with two soft cookie/cake-like halves, sandwiched together with a creamy smooth filling, these little snacks are delicious. Traditionally made with chocolate and marshmallow, a wide and versatile range of flavors are now available. The New England region claims the whoopie pie as its own. The Amish in Pennsylvania also lay claim and you can buy them from roadside farm stalls all over Lancaster County. However, Maine’s the only state where it is the official state treat! The story goes that these little treats were originally made from leftover cake batter and placed in lunch pails. When the person opened their lunch box and saw it, they would say “Whoopie”. Their Maine origins go all the way back to 1925 when Labadie’s Bakery in Lewiston, ME first started making them. And they still do today. The traditional cream filling was made with shortening, sugar and Marshmallow Fluff. That’s right, remember Marshmallow Fluff?! Recipes have been updated over the years and many bakers now use cream or icing as the filling. It’s not unusual to see petite sized whoopie pies measuring about 2” around all the way up to the jumbo (made for two?) size of about 6” in diameter. The record holding largest whoopie pie in the world was made in South Portland, Maine in 2011. Profits made from selling pieces of this 1,062 pound sweet treat were used to send whoopie pies to soldiers serving overseas. You can find whoopie pies just about everywhere you go in Maine. We love Cape Whoopie in South Portland’s Cape Elizabeth. Marcia Wiggins makes her gourmet whoopie pies using butter for the cream filling, and cuts down on the sugar so they aren’t too sweet. She has created 50 flavors (still adding to that), and changes her offering by season. For fall, she’s got Granny’s Gone Wild, a Granny Smith apple cake with chunks of apple and those wonderful fall cinnamon and nutmeg spices, filled with a caramel cream. Or our personal favorite, their Drunken Punkin, a pumpkin spiced cake with Amaretto flavored cream. Baked in small batches using the freshest and finest ingredients, these literally are not your grandmother’s whoopie pie. They are a little bit of culinary perfection! Marcia and her gourmet whoopie pies will be featured at this year’s Harvest on the Harbor in Portland, Maine running from 21st – 25th October. She’s providing the dessert for the very popular Lobster Chef of the Year event. They can also be found at Portland’s Whole Foods store and DiMillo’s on the Water in Old Portland. Not going to be in Maine, Cape Whoopie has you covered. They ship. At $59 a dozen, these make great gifts. Think holidays, birthdays and corporate gifts. Mint Dream for St. Patrick’s Day, Dark Strawberry for Valentine’s Day and even You Mocha Me Crazy for Mother’s Day (chocolate cakes with Kahlua and Espresso Cream). What a great way to share a taste of Maine year around. 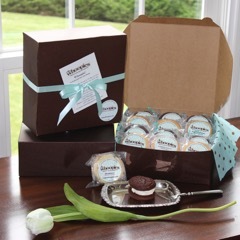 When our dozen were delivered here at the Inn, we said “Whoopie” too! Order yours today and tell them that the 1802 House sent you!